A mobile app gives your clients quick access to their gallery or album proof by creating a shortcut on their mobile device. This article will show you how that works. Sharing a link to your album gives your clients two ways to view their flip book. When accessed on a computer, your client will see their flip book in a web browser. If they open the link on their mobile device, they will see the mobile gallery and be prompted to install their custom app. 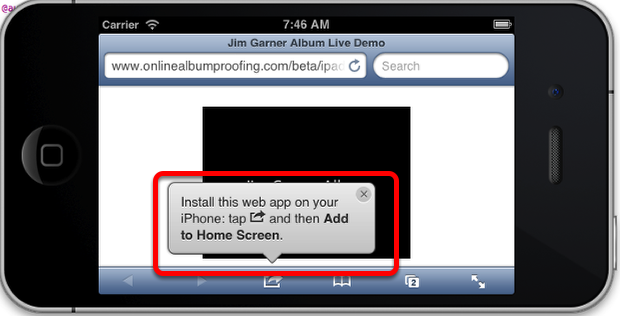 When your client opens the link on their mobile device they will be prompted to add the app their home screen. This is an option for quick access later. They will choose your logo (that has been added in the mobile logo section of your settings). By default the name of the gallery will be the app name. The client has the ability to change this if they would like. Note: Apple devices have a 12 character limit.